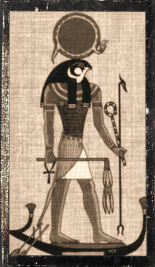 Blessing: Ra is a God of the sun and creation. As such, He is light, warmth and growth. He is the protector of the cosmos. As every sunrise is a rebirth and every sunset a death, Ra embodies renewal, strength and perpetual (re)creation. His solar barque is also said to carry the souls of the dead to the underworld, as well as the prayers of the living to their deceased loved ones. Ways to honor: Protect Ra’s creation through recycling and alternative energy use. Set up solar panels. Study the sun and its cycles. Go outside and stand in the warm sunlight. Write a letter to a deceased family member or friend. Plant a garden, especially one with sun-associated flowers.